A Canada Goose (Branta canadensis) taking his bath time seriously. I watched him for over half an hour and he was still going at it when I left. Canada Goose (Branta canadensis) bathing himself at Webster Pond south of Syracuse, New York. Nikon D700/80-400VR, 1/1250s, f/5.6, ISO 720, EV 0, 400mm focal length. Reminded me of this idiom from A League of Their Own when Jimmy Dugan (played by Tom Hanks) says, “Well, anything worth doing is worth doing right.” I’ll leave it up to the reader to find out what he was referring to. 😉 Idioms are the subject of Karma’s October Photo Hunt challenge. I have two I will use and am still in search of a third. Anyone have a suggestion? This entry was posted in Animals, Nature and tagged 80-400mm, autumn, bath, bathing, bokeh, branta canadensis, canda goose, cleaning, droplets, geese, migration, new york, nikon D700, splash, splashing, syracuse, vr, water, waterfowl, webster pond, wildlife. Bookmark the permalink. It was a glorious day so he might have been celebrating the Sun. I love the action shot too! Beautiful focus. Would you allow an archived photo? I bet I can find a photo to go with that idiom from the baseball tournaments. If not, I might throw it in as a bonus. It’s too good to pass up. Never saw that movie, so I have NO idea. It’s a great shot, love that you can see the water droplets flying. Just saw on Karen’s post that you only have TWO?! I already took pictures of seven (one of those I probably won’t use… not happy with it), and I have ideas for three more! Check out those links that Karen posted, that’s where I got most of my ideas. Hey, I only need three. 😀 Wanted to see if anyone else had some idioms. Wonderful picture and pose ! like Barbara I think this goose is welcoming the morning sun on his wings. A great moment you captured. Still need ideas for Karen’s photo hunt? How about “living on the edge”? That is a good. I did find another but not sure I can pull off the idea I have for it. This one…has possibilities. Great picture! There is something comical about it. 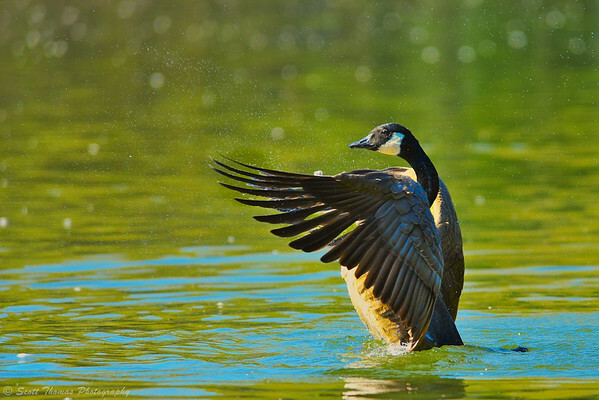 Wonderful image I love Canada Geese ! Scott, those blue shadows on the goose are pretty nice. I’m always amazed at how much birds seem to enjoy their baths. ‘The proof of the pudding is in the eating’ would go well with images of any of the food eating contests you photographed at the fall fairs. This bird was really into it. Never seen one do this for as long as he was. LOL That would work for something like an eating contest. Will add it to my list of possibles. Always a good thing when the heart beats swifter. Such grace and beauty! Love the blue reflections in the green-ish water and the soft light on the goose. Thanks, Tracy! The long lens helped here to compress the scene which was taken close to noon. The October Sun angle was a plus, too. And thanks for your inspiration from your posts about “Blue hour” – I have been using this several times, – did you see one of them in my previous post?! I did see it but didn’t leave a comment at the time. I did today.